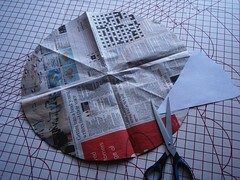 Making your own shower cap is fun, easy and relatively quick. 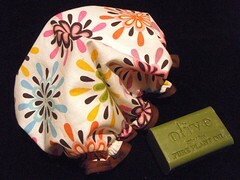 This shower cap comprises an outside layer of decorative fabric and inside layer of Rip-stop nylon. The nylon is designed to protect your special “do” from humidity and a little water. 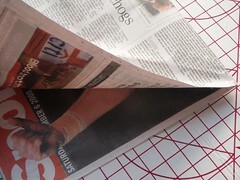 Rather than using a casing for the elastic, the elastic is stitched directly to the inside of the cap. 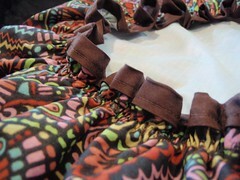 This gives a little frill around the edge, which you also trim with bias binding. 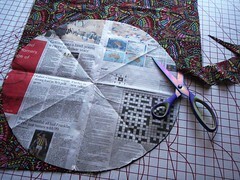 This is an easy project, but assumes that you are able to use your sewing machine confidently. If you are a beginner, you'll need to be aware that rip-stop nylon can be slippery to work with. 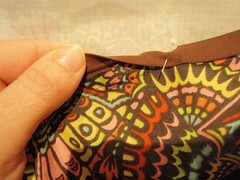 Be sure to use plenty of pins when initially pinning the layers of fabric. 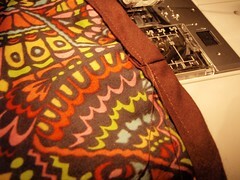 It is also useful to use plenty of pins when attaching your bias binding. The trickiest part of this project is stitching on the elastic. Unextended, the elastic is nearly three times shorter than the area of the shower cap that you are stitching it to. 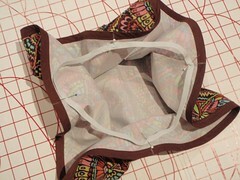 You need to be able to stretch the elastic and gather the shower cap as you stitch the two together. It requires a bit of care and patience. If you have never attached elastic like this before, it might be worth having a little practice before sewing on your nice fabric. 6. Stitch all the way around the two pieces to join them together. 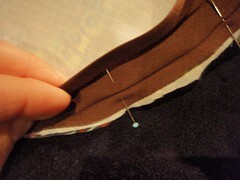 Take care to stitch close to the outside and then this stitching will be hidden by your trim. 7. 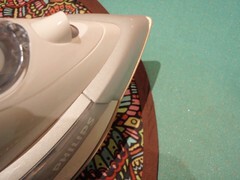 If the bias binding is not already folded in half, fold it lengthways, wrong sides together and give it a press with the iron. 8. 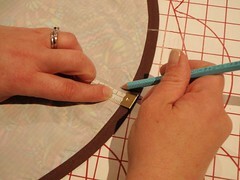 Open out the binding on one side and pin with the right side all the way around the cap on the nylon side*. 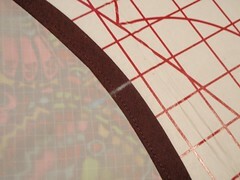 Allow for some overlap where the ends of the binding have to meet. *The raw edge of the binding and the shower cap should really line up in this picture – you can see that I’ve been a bit lazy! 10. 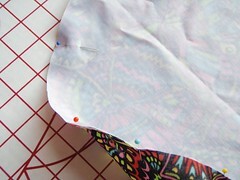 Fold the bias binding over to enclose the edge of the shower cap and pin in place on the outside. Where the ends meet, neatly tuck one into the other. 11. Starting and finishing at the join, stitch the bias binding in place on the outside. 13. 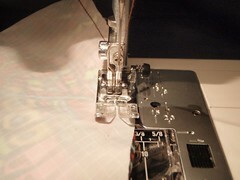 Thread a needle with the uncut thread and use it to stitch the join closed. Trim any remaining thread. 18. 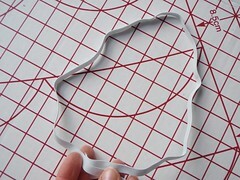 Make a loop with the elastic – overlapping the ends by 1.5cms [1/2”] each side – taking care to smooth out any twists - and pin. Secure with some stitches. 19. 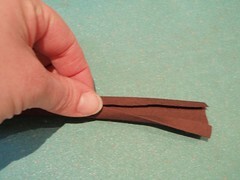 Fold the elastic to divide it into quarters and mark the division with pins. 20. 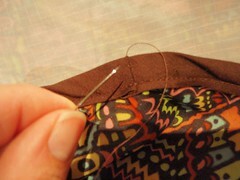 Before sewing on the elastic, you make like to change your thread before sewing. 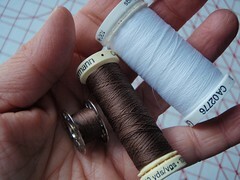 For example, I left brown thread in the bobbin and threaded white at the top. 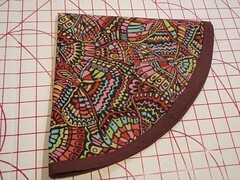 That way the stitching on the outside would be brown to match the fabric, but white on the elastic. 21. 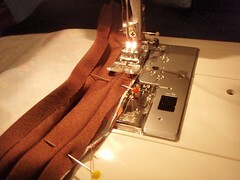 With the nylon side facing up, attach the elastic to the fabric using a 3-step zig-zag stitch (or plain zig-zag, if you don’t have a 3-step stitch on your machine). 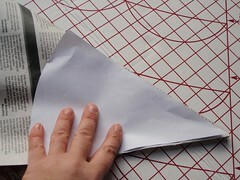 Note: There is far more fabric than elastic, so you will need to both gather the fabric a little and stretch the elastic. Try and keep even tension on the elastic as you stretch it out. If you pull too hard you might miss stitches. 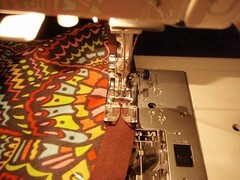 If, as you are completing each quarter, you feel you are running out of elastic, simply bunch the fabric a little more. 22. Your shower cap is ready to wear. Go forth and look glamorous, Bathing Beauty!